Kayak is one of those sports or hobbies that very few people practice. Whenever someone hears that a person is practicing kayaking, it immediately triggers attention as it is seen as a bold sport that requires a person with a lot of guts and an adventurous spirit. There are a lot of people that are also interested in giving it a short but never act upon it. It only takes a trip to a resort where a kayak can be rented, safety gear and the supervision of an experienced person. The ones that are thinking seriously about this hobby might want to just buy a kayak since they are not that expensive. Still, it is not enough to have a kayak and a car. A kayak cart should also be on the shopping list. A kayak cart is usually quite small but can easily carry a regular kayak since kayaks are not that heavy. A kayak roof rack can be an option but it requires installation every single time. A cart is very easy to setup, much more compact and not that expensive. They are similar to the carts used for boats but they are significantly smaller. We browsed through a good amount of kayak carts and we managed to trim down the list to something more manageable. Without delaying it too much, here is our list of the top 10 best kayak carts in 2019. Harmony Stowaway makes a great kayak beach chart. The model is quite compact and very intuitive to use. It is made with an aluminum frame with a kickstand and an easy mounting system. The cart also has large oversized wheels to absorb impacts. It can be locked into position and has soft foam padding to prevent the chart from damaging the kayak. The cart is so small that it might even fit inside the trunk of a car if needed. The cart is quite decent in terms of how it works and how small it is. The only problem is the high price tag. Not everyone is willing to spend this much on a simple chart. The fact that it converts into a chair is a major plus. It is an interesting feature and it does not change the design of the chart in any way. The problem is that it will get dirty very easily which means that it does not make much sense to use it as a chair. Also, it is not very comfortable to sit on. It is a great idea but not that greatly executed. If the spending budget is a problem, the FDW kayak cart will prove to be a valid option. It does not have any fancy features. It was just made to work as a cart. The cart has harnesses to secure the kayak and foam padding. It was made to support a maximum load of 195 pounds which is more than enough. The tires of the cart are inflatable and large enough to provide some impact absorption. Despite being made to transport kayaks, the design is not that great. It is a bit of a hassle to get the kayak in a good position and secure it properly. The straps do help but it takes several tries to get it right. The base or the frame of the cart does not have an ideal shape. Maybe if the cart was a bit larger it could have provided better support. 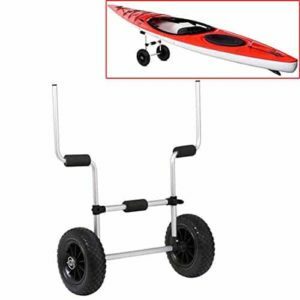 Challenger Outdoors kayak cart is quite similar to the previous models listed with the exception to some different for the tires and frame durability. The model uses al aluminum frame painted in metallic blue. It uses 12-inch balloon tires which do a better job at absorbing impacts from the bumps in the road. The cart can be used on pretty much all types of terrain due to its construction but it is better not to abuse it. 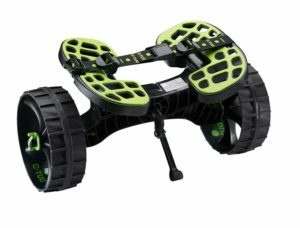 The foam padding offers some cushioning but the tires will help the most when using it over difficult terrain. Despite being a good pick for all types of terrain, the balloon tires work best on the sand. On solid terrain with bumps, they can jump off the road a bit especially at high speeds. It is important to drive safe when using the cart to avoid having the kayak jump off. When used on sand, the wheels should not have any kind of problems. 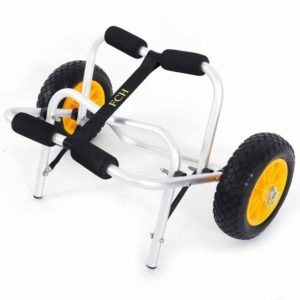 Yaheetech kayak cart is as simple as one cart could get. 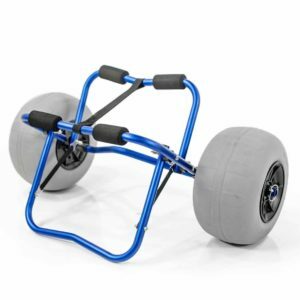 It is a two-wheel model with a tall vertical frame with rubber bumpers and inflated wheels. The bumpers help keep the kayak into place while the inflatable tires will absorb small road bumps. What will make most people pick this particular cart is the low price tag. 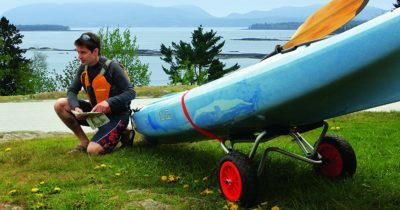 It is inexpensive and well built without being too complicated or having a lot of straps to secure the kayak. The aluminum frame is decent to carry a kayak but nothing more. It cannot sustain a lot of weight because of its design. It does not have reinforcements like other, more expensive carts. Still, because it is so simple, it takes almost no storage space and it is very lightweight. 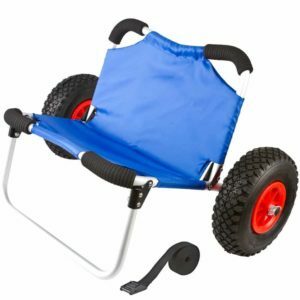 The Bonnlo kayak cart is a great pick for the ones that need something secure and well made. Even if the frame is made out of aluminum like with more other carts, it is quite durable due to the extra reinforcement. The cart is also lightweight and very easy to store. To ensure good transportation the cart also features rubber coating to support the kayak and inflatable tires to absorb small road bumps. It is not an expensive model and it is built to be robust and durable. The tires are a bit small. Most other carts have larger tires which allow them to better absorb impacts from road bumps. It is important to drive safely when using the cart and avoid dirt roads. It can work on sand but it should be used carefully to avoid having the kayak drop off the cart. The Ctug kayak trolley cart is one of the few models on the market that is not made out of aluminum. It has a frame made out of plastic but it is still lightweight. The top side has perforations and a rubber surface to ensure a good grip. To help to secure the kayak in place, the model also has a strap. 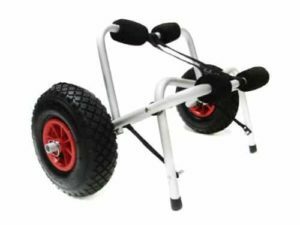 Looking at the wheels, the cart does not have inflatable tires and it is mostly recommended to be used on sand. Can support a maximum load of 300 lbs. For such a small cart made entirely out of plastic, it is quite expensive. It is difficult to justify the price tag. The ones that are on a budget might want to look at other models as well. The ones that can afford it can consider it mainly because it is very small compared to other kayak carts. It is lightweight and can easily be fitted in a trunk. 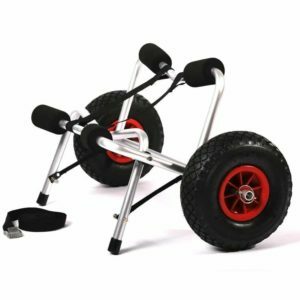 ABN Universal kayak cart is yet another cheap yet decent option for the ones that are looking to save some money. It is made with an aluminum frame with reinforcements, foam padding to support the kayak. 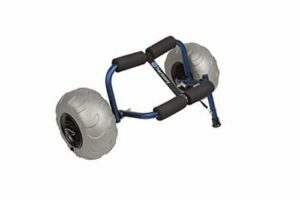 The model has large 10-inch inflatable wheels and an extra strap to provide better stability. The bumper pads will help prevent physical damage to the kayak while the wheels will reduce shocks from road bumps. Last but not least the cart is foldable which makes it even more compact. The foam padding used on the cart to provide some kind of cushioning and prevent scratches and dents to the kayak is not very durable. It will get damaged after a while and it is difficult to replace. An option would be to just used thick duct tape on the frame to provide some sort of protection for the kayak. 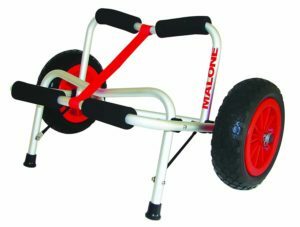 The Malone Clipper Deluxe universal kayak cart is quite similar to other models in our list at least in terms of design. It has a universal frame that works with canoe and kayaks. Also, it was designed to be foldable which makes it even easier to store as it is a small cart as is. The model uses an aluminum frame with foam padding and a locking kickstand. The tires are inflatable while the whole cart supports a maximum load of 200 pounds which is more than enough. As mentioned in other similar models, the foam padding used on the frame what will be in contact with the kayak is not an ideal material to use. It does provide some cushioning and prevents scratches and dents but the foam will get worn off quite quickly. It can be replaced using some standard foam padding but it is important not to use the cart without any kind of protection on the frame. 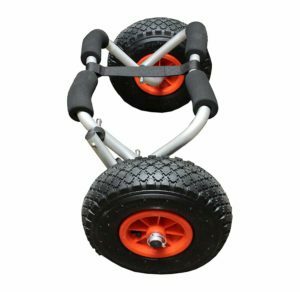 TMS Kayak Cart is a great pick for the pretty much anyone that is looking to save some money. It has a standard design that is similar to almost all carts and a fairly decent construction. What sets it apart is the low price tag. The cart has a foldable design with an aluminum frame, reinforcement straps, and foam padding. The wheels are quite large and do a good job at absorbing shocks from road bumps. The cart supports a maximum load of 150 pounds. Foam is not an ideal choice to support a kayak. It will get damaged easily and will need to be replaced to avoid causing scratches and dents to the kayak. It is a common problem and most kayak carts have it. The manufacturers did not think too well when they decided to go for foam padding for a cart that is supposed to carry something heavy. All the kayak carts that managed to make it to our list are universal which means they work with most kayaks. The main difference comes from pricing and some minor design variations for the frame. One model can be considered better than others under some circumstances. An ideal cart should be foldable as it will make it easier to store. Some types of frames do not need to be folded but others do. Also, the wheel type is important. Not all wheel types are suitable for all types of terrain. Some of them work on the sand while others are better suited for regular road conditions. For our list, we managed to pick a decent selection of kayak carts. Some models might even look almost identical but come with different price tags. Truth be told there are not that many variations to choose from and it is important to check pricing first ahead of anything.